"Emmanuella Grace is an Australian Singer, Songwriter and Piano Player. Based in London her music ranges from Satirical Cabaret to Jazzy Pop Ballads.She recently completed her debut album, London Stories, in collaboration with producer Snowy Raphael. The album is currently for sale via the website. Emmanuella originally trained in classical music and has performed in Choirs and Vocal Ensembles at the Sydney Opera House, The Barbican, Royal Albert Hall, for ABC Radio in Australia and the BBC in the UK. 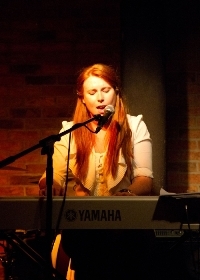 Emmanuella studied Musical Theatre and Jazz at the Queensland Conservatorium of Music, Brisbane. In 2009 she completed a B Mus Hon in Popular Music with First Class Honors. She has performed and recorded regularly, not only Jazz and Cabaret Music but Dance, Rock and Pop tracks as well as her own compositions throughout Europe and Australia." Music has always existed, no matter what happens we will keep making it. In whatever form we will create through sound. That is reassuring enough for me. That "promoters" don't promote and venues don't pay. They capitalise on the drive and desperation of artists to be heard. It breeds apathy and discouragement in artists that are on the scene for any length of time, that you are never paid your dues. They make money on the bar, money on the door and we just fork out cash for travel expenses. Not fair. Being a working musician, if you are doing it for life is not done as a choice. It is done because the drive in you to create music is stronger than any other desire you have. If my child wanted to be an artist I would support them whole heartedly but I would warn them that it is not glamourous, it is hard work and hard knocks but at the end of the day you have to follow your heart. Broadwood baby grand in red or brown wood for home. I grew up with a Broadwood upright and they are such a warm instrument. And I actually love my old yamaha P60 for gigs. They don't make them anymore but it is great as it works as a stage piano but also has speakers. The ones Yamaha now only have one or the other. This is the best of both. I think dinner with Sarah Vaughan would be lovely. She made me want to sing something other than opera.